America's New Kinder, Gentler Militia Although Michigan volunteer militias are still big on gun rights and wary of Washington, they aren't necessarily violent. The groups are now more interested in living off the land, survivalism and gun practice. 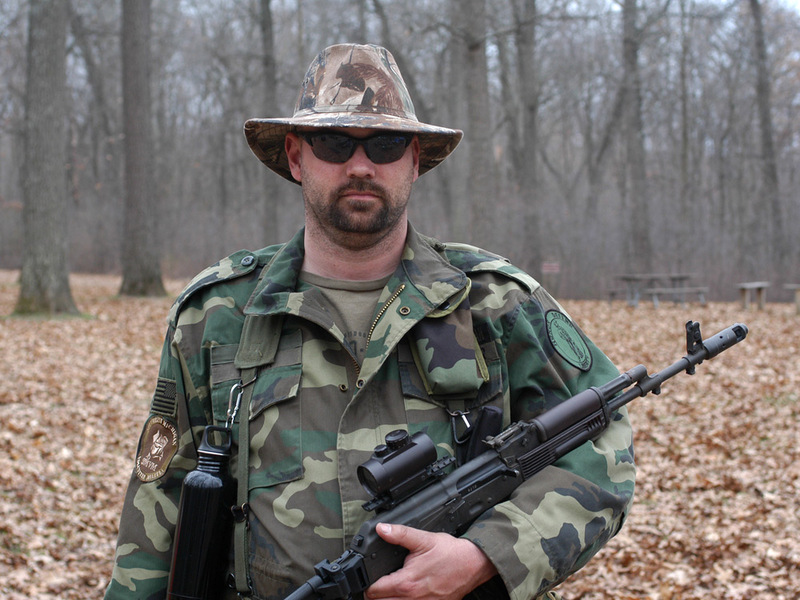 Mike Lackomar, a spokesman for the umbrella Southeast Michigan Volunteer Militia, says the public perception of militia groups as racist and paranoid is wrong. Federal authorities arrested nine members of a Christian militia group in Michigan named the Hutaree last month for allegedly plotting the murder of a number of police officers. The group was small, almost a family affair. It was headed by a Clayton, Mich., man, David Stone Sr., and its members included his wife, two of his sons and a handful of other Midwestern men. 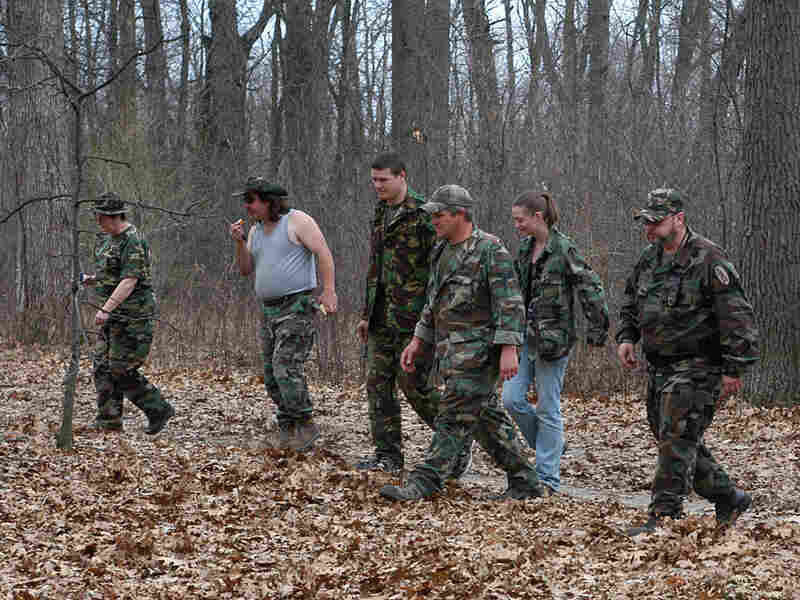 The group had videos on YouTube showing members on patrol in the Michigan woods, tracking some unknown enemy. They were heavily armed, and wore camouflage uniforms and face paint. Prosecutors say they were training for a mission: The Hutaree allegedly wanted to kill a local policeman and then, when other officers came to pay their respects at his funeral, take out a roster of them by bombing the procession. But law enforcement officials and experts say the Hutaree group is far from typical. Militias, for the most part, have changed and can no longer be automatically associated with standoffs with federal authorities like those that were seen in Waco, Texas, and Ruby Ridge, Idaho. Although the Michigan volunteer militias are still big on gun rights, and wary of Washington, they aren't necessarily violent. There is a new, gentler militia in America, an NPR News Investigation has found. Mike Lackomar, who speaks for an umbrella militia group in Michigan called the Southeast Michigan Volunteer Militia, was in the woods about an hour from Detroit for a recent weekend of training. "What I carry as part of my battle gear, my Level 1 gear, is I have an FRS radio, four magazines for my rifle, 30 rounds each," he said, as he started going through his pack and belt. "I've got a compass, military-style knife, my 9 mm sidearm, and two magazines for the 9 mm." All told, he figured the gear weighs about 35 pounds. Lackomar said it is what he would take on a normal training session. He was joined at a makeshift campsite by a couple of dozen men, nearly all of whom had the same kind of gear. They were all dressed in camouflage uniforms and were heavily armed. Lackomar said people have gotten the modern militia movement all wrong. "The first thing that is always thrown at us is that we are a racist group," he said. "That's most definitely not the fact. The second one is that militias in general are paranoid — or prepared to fight if things don't go their way. "And the truth of that matter is that militia is a defensive organization and always needs to be structured that way." The local militia in the Detroit area, part of the umbrella group Southeast Michigan Volunteer Militia, perform an exercise. The Saturday training focused on survivalist fare: compass reading and traps and building a fire. A handful of the men were watching as one of their own tried to use a bow drill to build a fire. It basically looks like the bow part of a bow and arrow, along with a spindle used to create enough friction to make a spark. The men leaned in, looking for a small ember where the spindle had been rubbing up against the wood. "That's the ember right there that will catch a fire for you," said one of the men, who would only provide his first name, Jaime. "You did it — now you are in the 2 percenters. Only 2 percent of the population can make a bow drill fire." His pupil, a middle-aged man with a gray brush cut, was triumphant. "Woo-hoo!" he hooted. Jamie smiled broadly. "You're a 2 percenter." The militias in Michigan weren't always so benign. In the 1990s, the militia movement in the state revolved around the twin suns of opposition to gun control and the Internal Revenue Service. The outside possibility of overthrowing the government was occasionally thrown in for good measure. The Michigan Regional Militia was seen by many experts as a paramilitary group just itching for a confrontation with law enforcement so it could spark a revolution. They even called themselves "patriot guerrillas." Jack Kay, the provost and vice president of Eastern Michigan University, has been studying militias and the white supremacy movement in this country for decades. He says militias have changed. "Most of the folks I talked to in the Michigan militia were very much distancing themselves," he said. "They were saying, 'We don't have an agenda of overthrowing the government. We're simply concerned about our own protection, living off the land, survivalism, gun practice — those sorts of things.' "
That is why the Hutaree group worried other militia members so much. People like Jim Gulliksen of Adrian, Mich., about an hour-and-a-half southeast of Detroit — "a nice little small town that used to be off the map, that now is very much in the spotlight" because of the Hutaree, he said, chuckling a bit. It is hard not to like Gulliksen. He's soft-spoken and gentle. He hands over a card that reads "Lenawee Volunteer Michigan Militia: The Original Homeland Security." A former Navy corpsman now in charge of the paint and hardware section of a nearby Walmart, he's the CEO of the local militia in Adrian. "I am one of these people that was very anti-militia and all this," he said. "I thought they were a bad thing until my wife talked me into sitting down and listening to my son explain what it is all about. And I learned a lot." As Gulliksen sees it, the militias in Michigan aren't out to destroy the government, they are out to maintain it. They want to lend a hand to local authorities and restore states' rights. He said the group has a good relationship with local politicians and the local sheriff, too. "I honestly feel that if there was an emergency like a natural disaster or a missing person, I don't think he'd have a problem calling on us to help," Gulliksen said. "If it was more of a law enforcement-type thing, rioting or something like that, he may be a little hesitant." In fact, a town supervisor in nearby Bridgewater, Mich., has already called on the volunteer militias twice this year to help find missing people. The militias fanned out on foot and horseback. While the searches didn't end happily — in both cases the missing person was found dead — it is an indication of how locals view their militias out here. That isn't to suggest that Gulliksen and the people who regularly show up to train with his militia are happy with the way things are in this country. They aren't. But the way they choose to express their unhappiness may be a surprise. "Violence is a very last resort," he said. "It is more we want people to wake up, realize what is happening, how many of their liberties they are losing, and get out to the ballot box and vote people in who are going to support the liberties and bring them back." Local militias are trying to hard to change their image. Lenawee's militia has adopted part of a highway. They are trying to work with Habitat for Humanity and have collected coats for needy kids. That's a far cry from how the Hutaree militia allegedly operated. Consider some of the rhetoric from the Hutaree leader, David Stone. In an FBI recording obtained by NPR, Stone was vehement about needing to step up and challenge the government. "In this nation, we think we are free, but you need a certificate to be born, a license to drive or permit to build, a number to get a job and even a paper after you die," he said in February, unaware that the FBI was secretly recording him. He was in a van with other members of the Hutaree driving to a militia rally in Kentucky. This was part of a speech Stone hoped to deliver there. "People in this nation as well as some around this world are waiting for those individuals, like you see sitting in this room — we're supposed to be down there, to actually make the decision to go to war against this evil, greedy new world order," he said. Stone's attorney has confirmed that the voice on the tape is that of his client. Some of the Hutaree members used to train in the woods with other regional militias like Mike Lackomar's group. He recalls that the way they handled their guns and just the way they operated made him nervous. "I thought they were a little reckless," he said. Lackomar said he found their training regime a little odd. They focused on ambushes, concealment, fire team movements -– essentially all the skills that might be needed in a firefight. "They trained at Level 10 all the time," Lackomar said. "They focused more on the military aspect than on the civil aspect, which we try to balance out." Lackomar said he wasn't surprised, especially, that the Hutaree were eventually arrested. He said they represented the old-style militias bent on violence. He's part of the new, more helpful militia — the kind, he says, no one needs to be scared of.